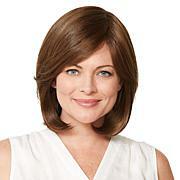 An easy-to-use, shake-and-go wig that offers the convenience of changing up your look without the commitment and fuss. Application is quick and easy; just shake and go! Remove the hair net from the wig. Gently shake the wig to separate the fibers. If your hair is long, pin it flat to your head for a smooth silhouette under the wig. Place the front of the wig at your natural front hairline and pull on so that the back of the wig is placed at the nape. 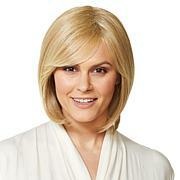 Adjust the wig as needed by sliding it from front to back or side to side. Use a rat tail comb to slip any loose ends under the wig. Use your favorite styling tool or fingers to create the look that's just your style. To wash, add 1 tablespoon mild shampoo to basin of cold water and soak for 5 minutes. Do not rub. Rinse until all shampoo is removed and dab gently with towel. Do not squeeze or twist. Hang to dry or use a blow dryer on a low setting. Excelle can withstand heat up to 350 degrees Fahrenheit. Oh my gosh - how adorable! Used to wear my hair in this style a l-o-n-g time ago.Never again can I say I have nothing to wear, cuz even a raggedy old t-shirt & cut offs would be sensational.I'm 74 & chose the light gray, which the color of my natural hair - I love it! I love the different colors in this wig. 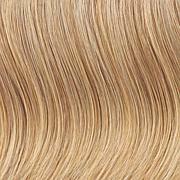 I have ordered others in the past but this is the first blonde color that I received that did not have dark roots. The style is great too. 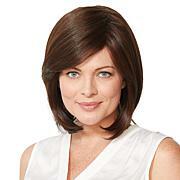 Beautiful dark brown hair product The wig size is average and it fits well. I tried many times to fit...but its too small and not staying properly. Also nape length is too short and not covered completely. I sent it back for refund.